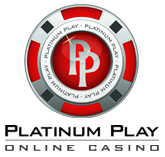 Euro Grand is an online casino powered by industry leading PlayTech casino development company. 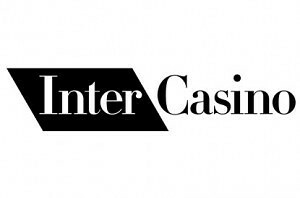 You’ll find hundreds of casino games offered, unrivaled customer service as well as a generous welcome bonus offered. There also are more than $5 million in progressive jackpots up for grabs, including some of the most popular progressive slots. If you’re looking for a safe, transparent and rewarding place to play, Euro Grand will be a great fit. Downloadable – download Euro Grand Casino and access all the games within one click directly from your desktop. Instant Play Version – play games directly from your web browser. No download needed and compatible with Mac, Linux, Windows and just about any operating system. Mobile – a recent addition to the range of casino software versions. Experience casino play on your mobile phone or tablet device with the Euro Grand Mobile casino. Pink Panther – 5 reel, 40 pay line slot game that is created after the popular cartoon as well as the movie with the very same title. Take a shot at one of the two progressive jackpots along with a chance to enter one of the five bonus games! Hulk – the green Marvels super hero is back and this time he’s managed to turn himself into a 50 pay line slot machine with amazing video cut elements as well as a handful bonus games. Of course, the Marvel Progressive Jackpot is also up for grabs. Gladiator – a recent progressive jackpot slot addition to the portfolio of Euro Grands slots. It’s a 5 reel, 25 pay line slot, themed after warriors from Roman times and offering a high 6 figure progressive jackpot up for grabs. Rocky – a game developed after the best fighter in the world – Rocky. Enjoy the ride of a 25 pay line slot machine with several bonus features, including expanding wilds. DareDevil – a yet another Marvel superhero has been used to create an online slot machine. This time it’s DareDevil who has turned into a 20 pay line video slot with 4 progressive jackpots up for grabs as well as a new, innovative feature called the bullseye. 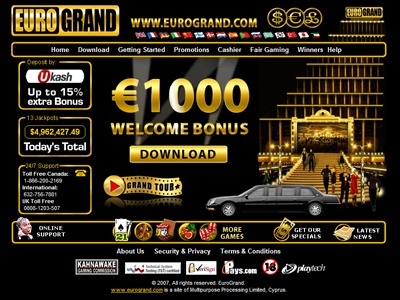 Euro Grand delivers some of the finest selections of casino table games you’ll find out there. This includes blackjack, roulette, table poker games as some games that we never even heard about! BlackJack – Perfect, UK, Classic, Surrender, Live and Switch variations offered. 25% up to $250 – receive an up to $250 bonus when you deposit $10 or more. 25% up to $1,000 HighRoller – deposit $4,000 and claim your highroller status along with $1,000 free! Both of these bonuses will have to be wagered for 25 times your bonus+deposit amount, meaning that a $1,000 HighRoller one requires total wagers of at least $50,000 on eligible games, before a withdrawal can be requested. Getting Started Guide – if you’re a new player, this will be a great handbook for you. Join Euro Grand Casino now and claim your $1,000 HighRoller Bonus!